Montdorensis is a warm-temperature mite. It moves, develops and reproduces slowly at cool temperatures with no activity below 11˚C. Adults can tolerate 45˚C in greenhouses but eggs and younger stages perish at this extreme. The optimum temperature range is from 20˚C to 30˚C. Short winter days and cool nights will not induce hibernation. As long as the mean daily temperature is warm they will keep working all year round. Typhlodromips montdorensis is an Australian species of phytoseiid predatory mite collected in southern Queensland during a Horticulture Australia-funded project that began in 1994. Due to its recent 'discovery' the use of montdorensis in commercial crops is in its infancy and research is ongoing. Montdorensis are small, pale, pear-shaped mites about the same size as twospotted mite. 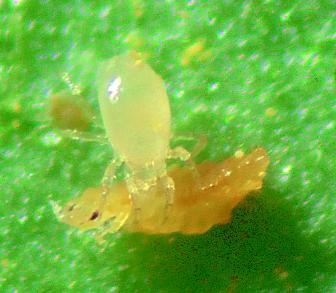 The gut contents take on a yellowish tinge when feeding on thrips larvae, pinkish when feeding on tomato russet mite, and greenish-black or brown when feeding on spider mite. 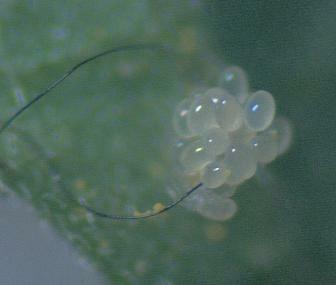 Eggs are clear and oval and laid on the under surface of leaves (often on hairs), under the calyx of fruit and sepals of flowers, or on cast skins of aphids and other detritus. Or view or download a PDF file of the Book entry for Montdorensis.